Details: A lucky catch at Tunnel Avenue (which I can't decide should be called East Greenwich, West Charlton or Westcombe Park!) on 21st June 2018 was a pair of crew ferry vehicles from nearby Morden Wharf garage. EY67WUB has already been shown on LTSV and is a Ford Transit Connect crew van. 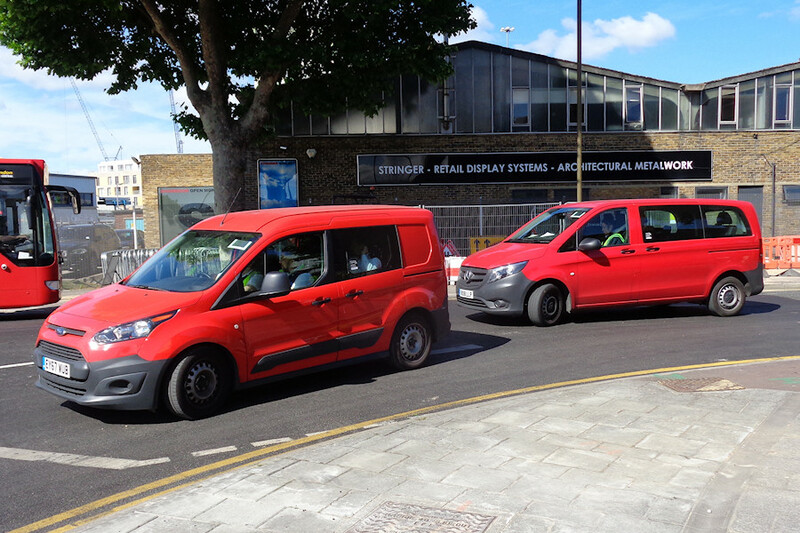 Close behind was RX18LLP, a recently delivered Mercedes-Benz Vito minibus, a type widely used by the Go-Ahead group. Similar RX18LLE works from Croydon garage and we suspect that several of the intervening registration numbers will be on vehicles at Barking (River Road). As normal for Go-Ahead crew ferry vehicles, anonymous red livery is carried. It will be noted that both vehicles have a duty number holder in the windscreen, though neither is in use.